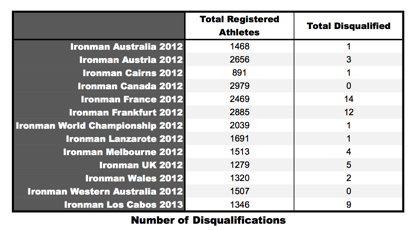 If rumours are to be believed Ironman Los Cabos was so tough that 41% of the field, over a third, Did Not Finish. It wasn’t. There’s no doubt Los Cabos was a challenging race, both the results and athlete accounts point to this, but it didn’t come close to that staggering rate of attrition. The actual number, calculated from the timing service’s results, was 14.9% and a further 19.9% of the registered athletes Did Not Start. I’ve no idea where that figure of 41% came from. Like many aspects of Ironman results finding data for DNFs, DNSs and disqualifications is remarkably hit and miss. The Ironman.com athlete tracker doesn’t record this information, instead I’m reliant on race websites providing it, something becoming increasingly rare as they standardise. In the case of Los Cabos – as a visitor kindly pointed out to me – it just so happens that they still link to results on a local race timing platform that incorporated details of DNFs and DNSs. My figures above come from that source, it also inspired me to look across the 2012 season to see if I could build a bigger picture of the DNF rate in Ironman. I found more detailed results for twelves races in the 2012 calendar, less than half. Based on the limited data in the Athlete Tracker I assume that athletes without finish times are DNFs, in many cases these athletes have no swim times either suggesting they may actually be DNSs, but there is no way of telling. The additional result information clarifies the matter, showing that in many cases over half the apparent DNFs in the Athlete Tracker are actually DNSs. There are exception, which I suspect reflects how races submit their final list of athletes – some including all registered athletes, others only those who picked up their registration packet. Without accounting for the DNS figures the DNF percentages for each race are artificially inflated. Most DNFs happen in the swim which seems unlikely. Adjusting the figures with the DNS data gives a clearer picture of what goes on. The rate of attrition in Los Cabos may not have hit 41%, but it was higher than average. Interestingly Austria, a fast race by reputation, ranks up there with a heavy drop out rate in the heat of the run. Some figures need questioning though: the 0% DNF rate in the swim at Hawaii last year seems unlikely for a start. One of the risks with mixing in new sources is the potential for inconsistencies to appear in the database, unfortunately these numbers aren’t perfectly reliable. Overall though it seems reasonable that the reality of the DNF in Ironman is it is quite rare during the swim and then, typically, evenly split between bike and run. Figures generally lie below 5%, perhaps there’s the potential to use that threshold as an indicator of a tough race; were DNF information more reliably recorded I could easily integrate this into my results analysis. In a very small number of cases – mostly male – not finishing is the result of a disqualification. They are rarely handed out, a fraction of a percent of the total results, but they do happen. I was reminded of the importance of checking my sources earlier this week when I gave the rumour that Ironman Texas would have a time trial start as fact on the IMTalk Podcast. It may not. A quick search resolved that one, but fact checking Ironman DNF rates has proved surprisingly hard. It’s worth bearing in mind that exceptional DNF rates are exceptionally rare and DNF numbers may be inflated depending on their source.